Out roaming on my own again at lunch time, I headed up to Suwanee Town Center, thinking that there must be a couple of places there that I had not yet tried. 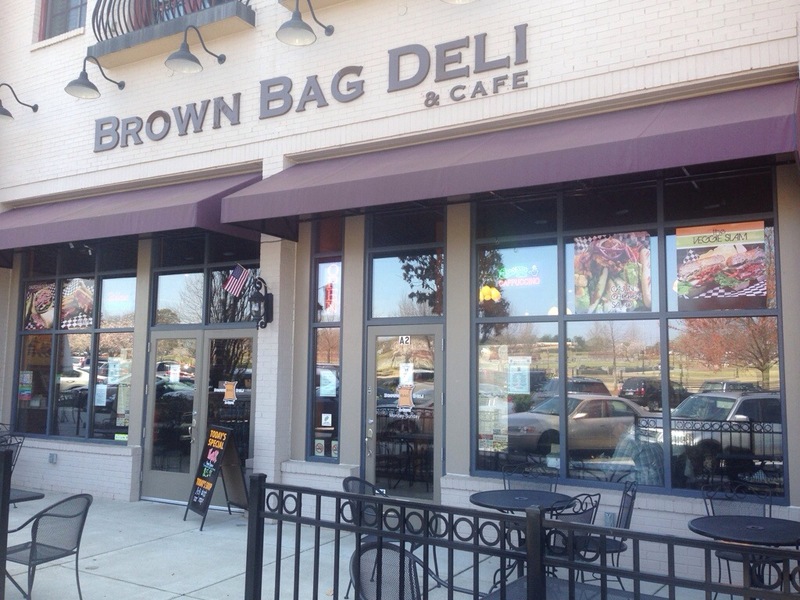 One of the first “new-to-me” places I saw was Brown Bag Deli & Cafe and my decision was made. I parked in front of the now-closed Uptown Grill and walked back down to the Brown Bag. Entering, there is a counter to the left, with a dessert case, and seating in the right half of the restaurant. 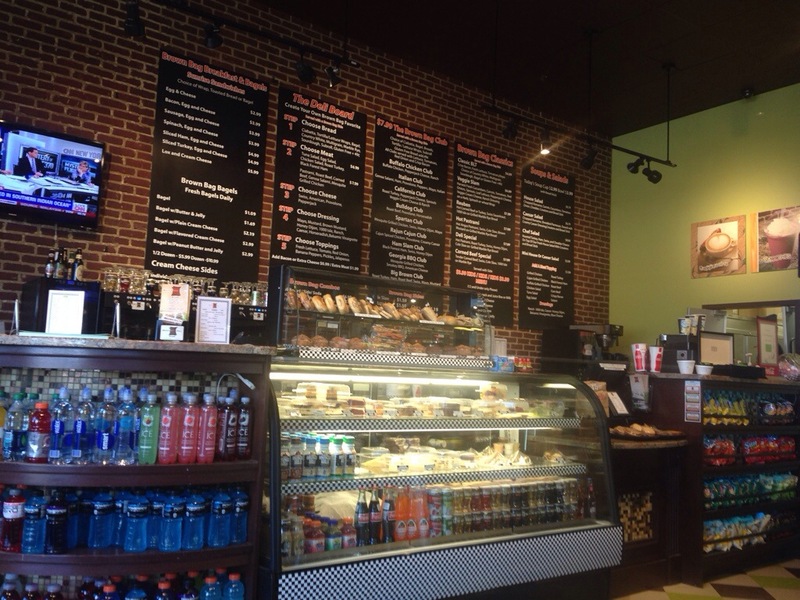 The menu has some pre-designed sandwiches, along with a build-your-own section. 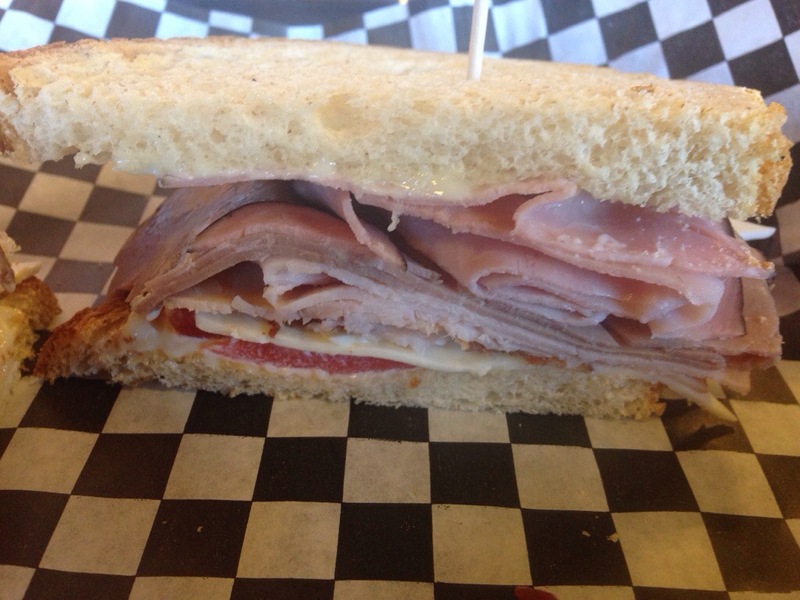 They have a wide choice of breads (ciabatta, country white, sourdough, herb or spinach tortilla wrap, multigrain, marble rye or a sub roll), and I ordered a Big Brown Club (ham, turkey, roast beef and American instead of Swiss cheese) on sourdough. I made it into a combo (chips / potato salad / cole slaw, yogurt / a big pickle and a soft drink), paid my $10.00+, took my number (6) and grabbed a table. As I sat there, I noticed that it was decorated very much like a coffee house , down to the designs on the seat backs (steaming coffee cups), with paneling, a fire place and art for sale on the walls. A few minutes later, the sandwich arrived. It was a perfectly fine sandwich. But this meal really came down to value, begging the real question: “was this sandwich 150% better than a subway value meal?” (That’s what the cost ratio was). The answer is “no”. It’s a glorified sandwich and a bag of chips, same as you can get dozens of other places, most cheaper.